The discovery of the antibacterial properties of penicillin by Alexander Fleming is legendary, but the war time transformation of this breakthrough into a pharmaceutical product administrable to patients was achieved at the Sir William Dunn School of Pathology, Oxford. Howard Florey and his colleagues Norman Heatley and the Jewish refugee Ernst Chain created a new industry of antibiotic production transforming Fleming’s biological curiosity into a clinical tool that fundamentally changed medicine. 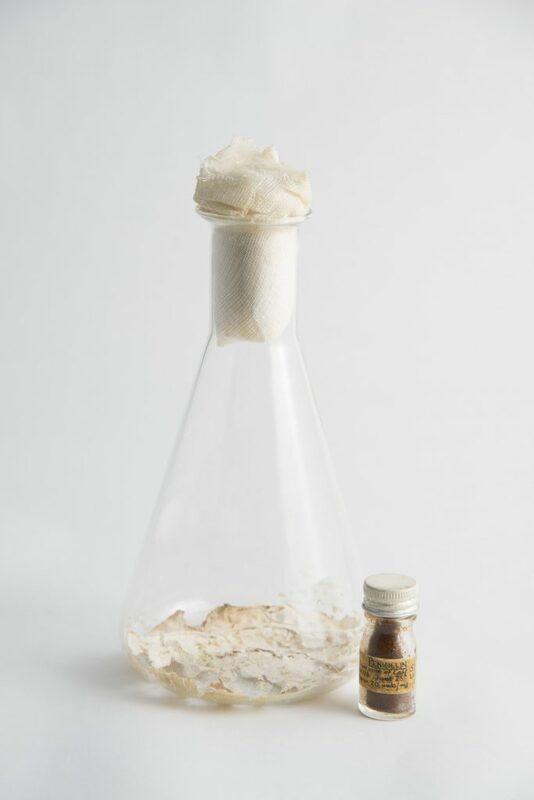 This is one of the original cultures of Penicillium notatum (now dried up) that Florey’s team used to extract penicillin, the flask contained 300 ml. of culture fluid and the fungus floated on the surface. Promising early results in mice resulted in Florey’s laboratory being transformed into a production centre to make enough penicillin to allow human clinical trial work in 1941. Ernst Chain worked to increase the yield from the cultures; it was necessary to produce 2,000 litres of culture fluid to obtain enough penicillin to treat a single case of sepsis. So precious were early stocks that this early specimen of penicillin, dated 25 June 1941, was recovered from patients’ urine. In order to scale up production quickly in the context of war time stringencies laboratory apparatus had to be improvised, the MHS holds sheep dip cans, bedpans and biscuit tins that were used in Florey’s new penicillin ‘factory’. Almost miraculous recoveries from apparently fatal infections demonstrated the therapeutic value of the antibiotic. Wartime Britain was unable to produce penicillin on the industrial scale so urgently required, so Florey and Heatley moved production across the Atlantic in 1941, before the United State joined World War II.